Kotaku 'Shop Contest: A Coat For Max: Winners! 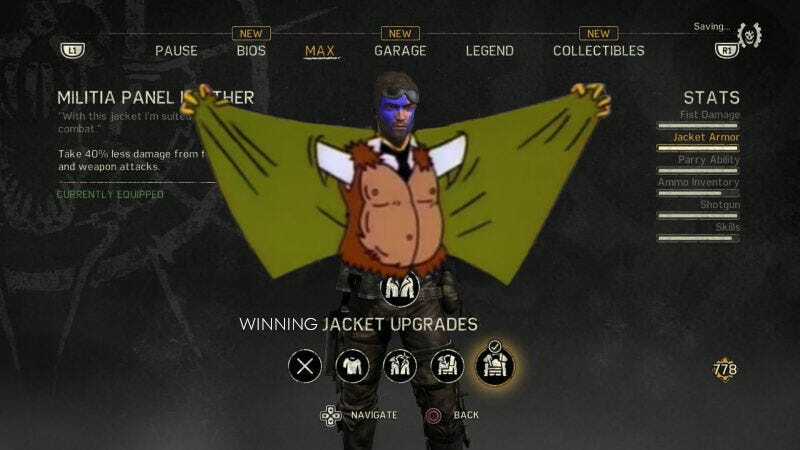 When Kotaku’s editor-in-chief voiced his dissatisfaction with a jacket worn by the title character of the Mad Max video game, our image-manipulating community sprung into action. Now he’s got plenty to choose from. But popular opinion be damned! Why not give Mr. Totilo a choice? How about giving him my choices? Sounds good. Poopemon — because I’ve a feeling Totilo would approve highly of this. Evan Miller — because Tunnel Snakes indeed rule. Until I kill them all. 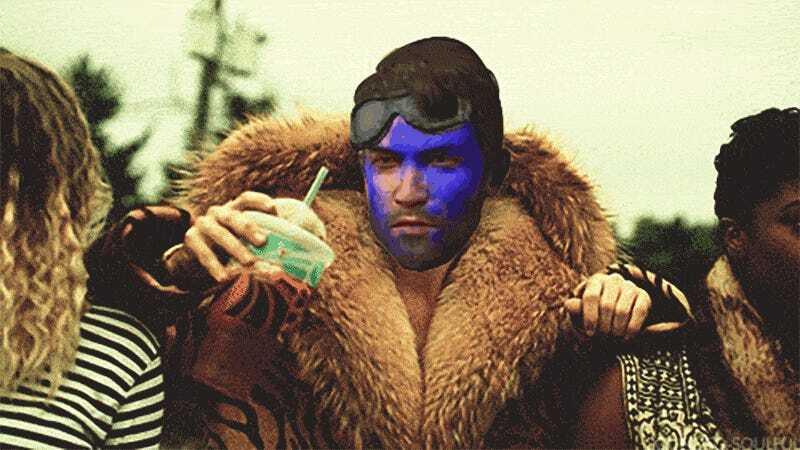 BrashestTracksiest — because he blue himself but didn’t completely cover his face. madcatalyst — because he’s right, MacLean’s face makes it. Subieroo — sensing a theme developing here. det-devil-ails — because those dogs survived the apocalypse. Mad Max — because his name isn’t Sane Sean. The Real Kanra — because we need more post-apocalyptic musicals. SonicBoom — because even the wasteland celebrates Christmas. Mister Shibbles — cause this is just thrilling. kustard — because it’s the best jacket. wrecks — though I am still not sure what he changed. ElTomTom — for making him ridiculously good looking. Iconking — for suggesting an appropriate place to shop. psyko_faze — IN YOUR EYES. sillstaw — because this is an appropriate crossover. Gorillanator — for never saying goodbye. JurassicBark — for the image that fast-tracked a live-action movie. Taurenrider of the Tasty Chips — because I kinda want this jacket too. Zelda Did It! — for giffing out the Mackelmore. uscg_pa — it shall be immortal, I tell you! Alluvian_Est-Endrati — because Zardoz. C’mon, people. Area Effect — it shall live on forever! MrDeadScott — he doesn’t look so lonely to me. Zhesty — for doing Braveheart besty. sciteach — because all I want is life beyond seeing this image. spaceludes — oh I get it, it’s a wrestling theme! Join us later today for a new ‘Shop Contest. Maybe this time we’ll do pants!